Description - Endurance Rubber Tiles are one of the most versatile modular tiles on the market today. Made with recycled rubber and plastic, these interlocking tiles can be used virtually anywhere. From the garage to your home gym, these tiles are certain to be the perfect floor for your needs. Featuring great shock absorbency and durability, a 15-year warranty backs these rubber tiles. Material – Constructed of 75% thermoplastic elastomer and 25% polypropylene copolymer. Recommended Uses – Endurance Rubber tiles are the perfect floor for any space in and out of your home or business and has been used as flooring for trade shows, as sport court flooring, for pickleball courts, as garage flooring, in-home gyms, as Cross Fit gym flooring, as basement flooring, as event flooring, in offices, and much more. Great for basketball courts, gym flooring and much more. Features a 15 year warranty. Live in low country with flooding periodically in basement. Want a grid floor that will allow water to flow under it towards sump pump. Our Rubbertrasx Tiles will allow water to flow through and under these tiles to your sump pump. Even the solid tiles interlock loose enough to allow water to pass between the tiles and to flow to the sump pump. Since these tiles are constructed with both rubber and plastic, they are mold and mildew resistant and are very easy to uninstall, clean, and reinstall in the event there is a major flood. My concerns are that tiles not will lock together flush and stay that way (no raised edges between tiles). Tiles are being used on a poured concert basement floor. Our Rubbertrax Tiles when interlocked will stay locked and flush. These tiles have a very durable interlocking system and can withstand the daily abuses of working out on them or having a car drive on them. Can you see through these? Can you see the floor under these tiles? You can see through our Endurance Rubber Tiles in the Ribtrax and Smooth Ribtrax patterns. The Diamond pattern, you would not. What is the psi rating on these tiles? Our Endurance Rubber Tiles have a psi rating of 1250 and can withstand rolling weights up to 25,000 lbs. How chemical/automotive fluid resistive is your product? Our 3/4" Endurance Rubber Tiles are resistant to most household and vehicle chemicals. They are very easy to clean and maintain and are just as easy to install, remove and replace when damaged. 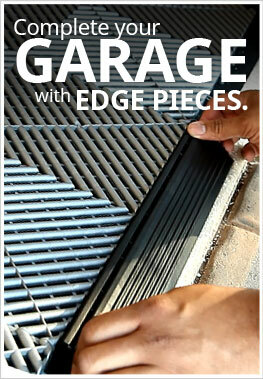 These tiles would have the same resistance to chemicals as our standard garage tiles. I bought these after one of the sells reps said this might be a good option for my garage / gym that I put in. I have a squat rack in my gym and a bench and do some olympic lifts and wanted something that would give me some give. Working out on the concrete was killing my knees. I was going to go with a different product at first but the sales rep told me to get a sample of this and the flex tile. I really like this product over the flex tile since it was a little thicker. Its also really comfortable to workout on. The tiles were super easy to install and have been easy to clean. I park my car when I'm not working out, so I like that they can withstand the weight of it. Once it get's a little nice our here, I will have to send a picture of my install. I bought these anti-fatigue squares to use around my cutting table in my sewing studio. They were not what I expected. They were hard as a rock. Being anti-fatigue I was expecting them to be squishy. They weren't going to work for my application so I returned them. They might work if you just need a protective surface. I had a problem with my flooring because I laid it in my cargo trailer. I used double sided tape and it buckled when it got super hot inside . I called the company and they sent me some glue to use to put down . This company is the greatest , I would recommend them to anyone.